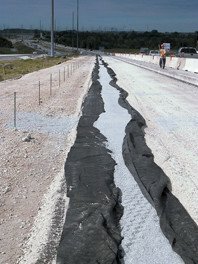 Understanding geotextiles - geotextiles and geosynthetics are major contributor to improving the world's infrastructure. A strong interaction and spirit of cooperation has developed among suppliers of geotextile and geosynthetic products, consultants, universities and field civil engineers with regard to the use and specifications for these materials. There is no one type of geotextile or geosynthetic that fulfills all needs; therefore, the development of specialty materials and their applications continues to grow. Geotextiles act as filters between soil and drainage gravel, preventing soil particles from being carried away by the filtered water. The drainage gravel has a tendency to become clogged, and the soil has a tendency to be washed away. The role of geotextiles as a filter is to limit this phenomenon. Separation refers to the ability of geotextiles to prevent the mixing of two materials, such as a soft subgrade with a clean base aggregate. Soil movement is reduced by the confinement and reinforcing action of geotextiles, which function by absorbing part of the stress that normally would cause shear failure. The lengthwise permeability of the geotextile allows it to perform as a drain. The amount of drainage is proportional to the thickness of the fabric. In 1926, the South Carolina Department of Highways used heavy cotton fabric on a primed earth base, followed by a hot asphalt coating topped with sand to reinforce roads. These roads exhibited reduced cracking and localized failures, while the cotton fabric remained intact. As the cotton fabric degraded, the roads gradually deteriorated. In the early 1960s, woven monofilament fabric was used to eliminate an erosion problem along waterfront property in Florida. The success of this project resulted in the US Army Corps of Engineers using the monofilament fabric for erosion control and subsurface drainage. The US Department of Agriculture Forest Service also began to experiment with woven geotextiles to stabilize logging roads in the mid-1960s. Some early woven geotextile fabrics were made with Saran monofilament yarns, but later were made with polypropylene (PP) monofilament yarns as they became available. Around this same time in Europe, strong interest was growing in geotextiles, in part driven by higher prices and scarcity of gravel and sand. Geotextiles allow more efficient use of these materials. Products for use in civil engineering applications are sold on a specification basis. Because of the conservative nature of civil engineers and others in the construction industry, the early acceptance of geotextiles was slow. The terminology and testing methods used by the fiber and textile industries are vastly different from those used by civil engineers and the construction industry, so a mutual education process was necessary. An important step in establishing geotextiles standards in the United States was the establishment in 1984 of Committee D 35 on Geosynthetics by ASTM International, West Conshohocken, Pa. The committee established subcommittees for mechanical properties, endurance properties and filtration. The members of Committee D-35 on Geosynthetics have played a key role in the development and acceptance of geosynthetics by civil engineers and the construction industry throughout the world. Robert M. Koerner, Ph.D., professor of civil engineering at Drexel University, and director of GRI, has worked closely with ASTM, geosynthetics producers and the civil engineering community to promote the use and acceptance of geosynthetics. He has worked diligently with Committee D-35 since its inception to expedite the development of standards for geosynthetics. As an educator, Koerner has integrated geosynthetics into the civil engineering curriculum and conducted numerous workshops and courses on geosynthetics for practicing civil engineers throughout the world. Hybrid systems of any or all of the above geosynthetic products that are specially designed for use in rock-, waste- and liquid-related problems. PET use in geotextiles is growing for specialty, high-performance applications where low creep and a high degree of dimensional stability are required. Most woven geotextile fabrics are made from slit film PP yarns, monofilament or continuous multifilament yarns. A major application for slit film PP fabric is for silt fences to control sediment runoff from construction. Most slit film yarns are pigmented black to maximize their sunlight resistance. Woven monofilament fabrics are often used in erosion control applications. Nonwoven fabrics for geotextile use can be made from either staple fibers or from continuous filaments in the form of spunbonded fabrics that are subsequently needle punched. The needle punching process enables fabrics to be made with controlled porosities. High-porosity fabrics reduce the potential for clogging, making these fabrics useful for subsurface drainage and erosion control. Heat bonding of nonwovens provides thinner and stiffer fabrics of lower porosity. The higher strength of heat bonded fabrics makes them useful for road stabilization applications. In geotextiles, PP will continue to amount to more than 50 percent of the polymer used. The use of PET, particularly in woven fabrics, will grow in areas where its higher modulus and lower creep properties will be an advantage. Use of geocomposites will continue to increase as producers develop improved bonding and lamination techniques, and specialty product uses also increase. The separation of polymer producers from the geotextile and geosynthetic industry will produce more of an engineering approach to their use rather than a commodity marketing mentality. CONTACT US for more information or if you are interested in yarns or fibers for geotextiles.